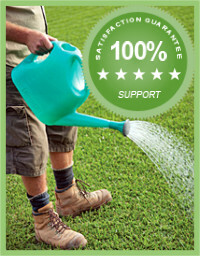 At Harden Park Lawns, we are committed to customer satisfaction. To ensure that you are completely happy with your turf purchase and your new lawn, we provide lifetime support for all Sir Walter lawns installed. Our team are born and bred in the local area and this ensures that you receive advice and support specific to the local area, where you live and where your turf will be laid. We offer a range of videos, articles and blogs to help you to maintain a healthy and thriving lawn for you and your family to enjoy all year round. If you have a specific question or lawn care question, we invite you to get in touch with the team – we’re happy to help. With our years of industry experience and a highly skilled and expert team, Harden Park Lawns can handle the smallest of orders to the largest of requests. We invite you to read more about our Turf Varieties or Contact Us For Advice on the best lawn choice for your Life Style, Family, Landscape and/or Commercial project. We are local and we are here to provide good honest advice. If you ready for an obligation free quote, simply fill in the form below and we will get back promptly.